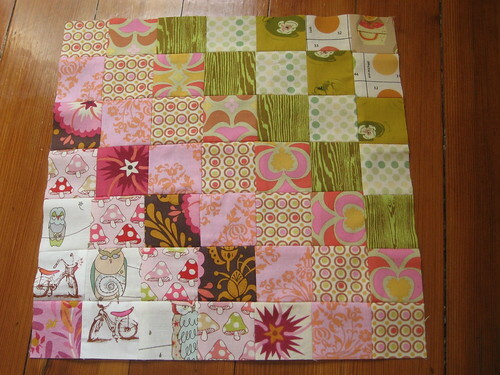 Morgan’s Quilt, originally uploaded by SewLaTea. It’s finally done 🙂 Don’t ya just love that feeling of accomplishment? 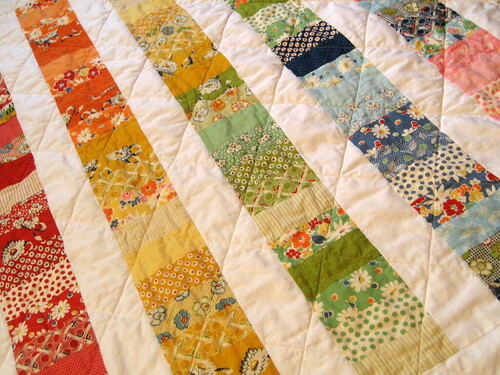 I used crazy mom quilt’s stacked coins tutorial that I found on Moda Bake Shop. In the past I have adapted Joelle Hoverson of The Purl Bee’s (Last Minute Patchwork & Quilted Gifts) instructions to make a stacked coins, but this time since I was working with charm packs, the tutorial from crazy mom quilts was a perfect match 🙂 At first I thought I would scatter the colors around randomly, but on a whim I placed them in rainbow order and I kinda liked it, so I sewed it up that way. I hope Morgan (and her mommy) will like it! Binding Morgan’s Quilt, originally uploaded by SewLaTea. I am finally getting the hang of it. 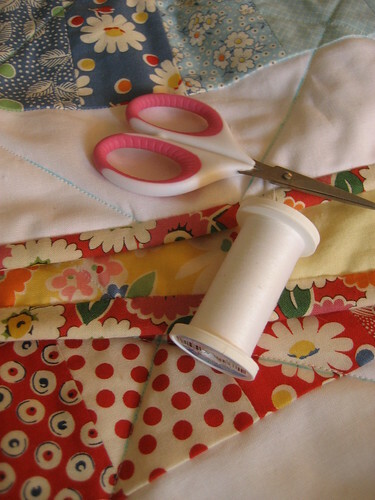 I learned how to make and sew binding from crazy mom quilts’ tutorial. It’s super easy to follow and the pics are very helpful. I had to double check my work with this quilt, but I think next time I’ll be able to make and sew the binding without following any direction. Now that the quilt is quilted and bound, it’s ready to be washed to a)get rid of those baby blue quilting lines and b) make it all wrinkly and yummy. 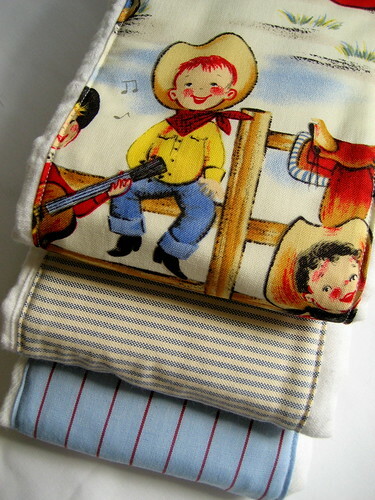 After that I’ll attach a label I plan on making using Printed Treasures printer fabric. I took an adorable picture of Morgan and her sister and added text to it using Picnik. Anyhoo. Off to bed. I’m always up too late! Now if only I could choose what my next project will be. I just got some new fabrics from Fabricworm and am in the process of building my raqua (red/aqua) collection. 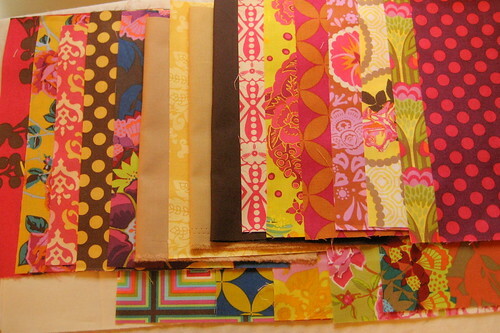 Not sure what type of quilt arrangement will showcase this color theme best. Any suggestions? 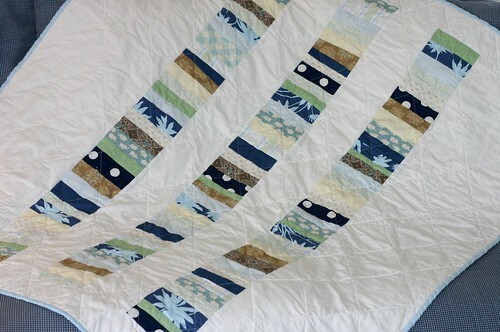 I have seen it done as a wonky log cabin (always a crowd pleaser) and as a mod sampler quilt…though I was thinking of trying something different….paperpieced string quilt? strip quilt? ???????? Stacked Coins for Ben, originally uploaded by SewLaTea.